Back in February, Tulsa Police Chief Chuck Jordan got a call from a retired officer about a photograph he’d spotted at the Vintage Tulsa Show in the Exchange Center at Expo Square. Jordan immediately jumped in his car and headed to the show, where he found a photograph of Barney Cleaver, Tulsa’s first African-American law enforcement officer. After haggling with the seller, Jordan purchased the photo and began researching Cleaver. “He was a pretty prominent figure,” Jordan said. Cleaver, a Tulsa resident and business owner, began working for the Tulsa Police Department in 1907. 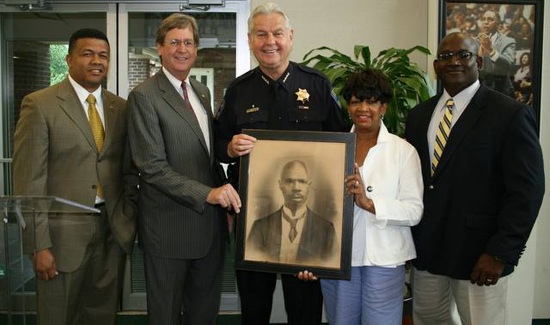 As a way to commemorate the 95th anniversary of the 1921 Tulsa Race Riot, Jordan and other TPD members presented the photograph as a gift to the Greenwood Cultural Center.